Comfort food for me definitely involves Indian spices. I love the smells of cumin, garlic and onions wafting through the house. There’s no way to beat it – especially as colder weather is approaching and the urge to hide indoors starts to peek out! 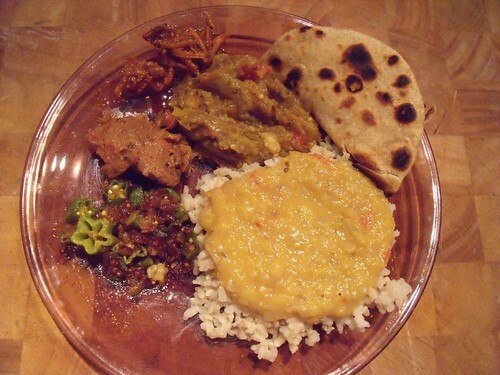 One of my favourite comfort dishes is an Indian dhal with lentils. In fact, you can prepare lentils just about any way you’d like and I’d find them gloriously satisfying from their sheer earthiness. But lentils as a dhal are just wonderful. 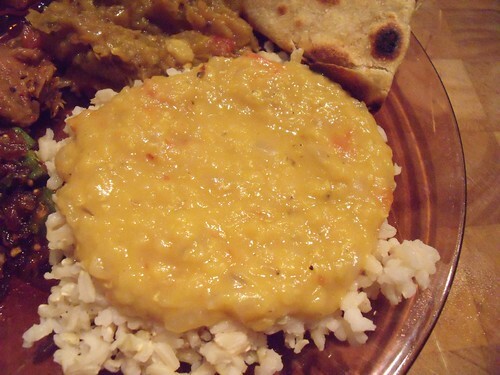 This is another variation of a lentil dhal, this time with red lentils, as they cook so quickly. If you are supremely limited for time, you can have this on the table in 15 minutes, if you make the tomato-onion-spice seasoning while the lentils are bubbling away on the stove. The other nice thing about this recipe is that it works so well as a make-ahead dish. I think it often tastes better the next day — or you can make it earlier in the day and reheat before serving. I always make sure to make a big enough batch that I’ve got leftovers for dhal over brown rice later in the week. 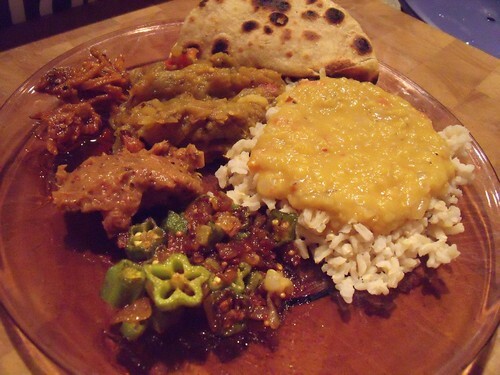 We enjoyed these lentils as a part of an Indian feast we had earlier this week: Masoor Dhal, Curried Okra, Baingan Bharta (Roasted Eggplant), Whole Wheat Chapati, and brown rice, with our favourite condiments: lime pickle, rhubarb chutney, and hot carrot pickle, accompanied by a side dish of plain yogurt. In a large pot, bring lentils, water & turmeric to a boil. Turn down the heat and simmer over low heat until lentils are cooked, about 10-15 minutes. Add the salt and set aside. Heat oil in a small pan over medium-low heat, and heat cumin, chili flakes, asafoetida, garlic, and onion. Once the onion is translucent (after about 5 minutes), add tomato and continue cooking until the tomato is softened, about 5 minutes. Add this tomato-onion-spice seasoning to the cooked dhal. When serving, top dhal with the fresh coriander leaves, and eat with brown rice, chapati, and your favourite curried veggies.